I joined the Scottish Marathon Club in 1960 and for one of my first races I was to be picked up by Jimmy Scott in his van outside Queen Street Station in Glasgow. When I first arrived there was no one else waiting other than a man with glasses, a toothbrush moustache and hair slicked back. We got talking and he was very friendly. As the weeks and months went by, I became quite friendly with Bertie Cox who was a good class road runner for Greenock Wellpark Harriers. We also met up at the annual inter clubs between our two clubs and at Marathon Club presentations and socials. His son, Hammy, was to be a much better athlete than his father and known throughout Scotland from early on in his career. No stranger to controversy, he was a very talented runner respected throughout the sport. He came into the sport as a boy and in 1971-72 as a Senior Boy (Under 15) was 28th of the 171 finishers in the National Championship. A year later and in the same age group he had moved up to sixth. As a Youth (Under 17) in 1973-74 he was seventh, and then was back up to sixth in 1974-75. He had moved that year to the new club of Spango Valley AC. He raced in more than the National of course but his progress as marked in these events was marked. He was also a very good relay runner generally, whether on the road or over the country. In the West District Relays he tended to specialise in the first stage where he had some really outstanding races. In 1976 he led the first stage home and Spango Valley was third team. The following year they were second after he led the first stage with the fastest time of the day, and in 1979-80 he won the first stage for the winning team. In 1981-82 he was again first on the first stage with the fastest time of the day for Spango Valley. In 1982-83 he turned out for Bellahouston where he was fifth fastest for the unplaced team. He didn’t run again for the Bellahouston team in the West District Relays. In 1982, his team was second in the Scottish Relay Championships. A great triumph was in 1985 when Bellahouston Harriers won the Scottish Six-Stage Relay championship and they added Scottish Cross-Country relay bronze that autumn. He ran subsequently for Glenpark Harriers in the West District Relays with his best run being in 1988-89 when the team won. This time he ran on the second stage and brought the team from 20th to fifth. If we stick with the country for now, he ran in nine District Championships as a Senior with many fine runs among them – 13th in 1976-77, tenth in 81-82, 12th in 84-85, 4th in 85-86, 5th in 88-89, 5th again in 89-90 and an unwilling 2nd in 1990-91: I say unwilling because Tommy Murray who had won was disqualified and Hammy was upgraded to second from third. Equally unwilling to be elevated to first place was Alaister Russell who was quoted in the Press as saying Tommy won the race fair and square The reason for the disqualification was simple: – Tommy had resigned from Glenpark and joined Cambuslang but had been entered for the West championship by Glenpark before his resignation. He refused to wear a Glenpark vest and so was disqualified. It had been a good year so far for Hammy who had been second to John Sherban in the Nigel Barge Road Race and then won the Jimmy Flockhart Memorial Cross-Country race at Coatbridge. However none of his hoped for Scottish selections had come to pass, mainly I suppose because he ran mainly on the road. The March 1991 issue of the “Scotland’s Runner” carried this under the headline “Cox Snubs Officials.” Despite heaping abuse on Scottish Cross-Country Union officials, the confused Greenock Glenpark runner Hammy Cox was offered an olive branch then snubbed them again! Cox, citing his road form, had ranted at international team manager Jim Scarbrough and his fellow selectors when he was passed over for national cross-country teams this winter. He stated categorically that he would not compete again for Scotland. A week later he complained that the selectors had the nerve to believe this when they read it in the papers. “They should have checked with me,” he said. Then, after having finished third in the West District Championships behind Tommy Murray (later disqualified) and Alaister Russell, he yelled at Scarbrough, “You couldn’t pick your nose!” He declined to accept his medal. “I wouldn’t shake hands with any of that lot,” he said. But he confided he wouldn’t mind running in the Inter-County Championships. “I can get plenty of road races on my own but I need to be selected by Scotland to run in the Inter-Counties,” he told me. All credit to the long-suffering Jim Scarbrough – when he heard this, he phoned Cox and offered him a place. You’ve guessed it, Cox turned him down! At 34, Hammy Cox has been running competitively for 19 years and over the past few years has earned himself a reputation as one of Scotland’s better distance runners. Cox, a civilian mechanic with the police in Greenock, spent his formative years as a track athlete concentrating on 800 and 1500 metres. At 15 he was fastest senior boy in Scotland over 1500m with a personal best of 4:13 and throughout his teens also held a number of Scottish Schools and club titles over 800m. “My father was a good athlete and he gave me lots of encouragement,” says the Glenpark Harrier whose own children, Graeme 16 and Jill 14, have distinguished themselves as junior and schools athletes. Cox made the move from track to roads four years ago. His first half-marathon attempt was at the Luddon in 1987 – and not only did he win but he broke the course record! With the event now a 10K, his half-marathon time of 64:31 presumably can not be bettered. “I suppose I should have increased my distance years before I did,” he now reflects. “Until 1987 I was still battling away on the track and getting nowhere.” Having found his niche rather later in life than he might have liked, Cox didn’t waste more time making his mark. After his revealing debut at Luddon, he decided to test his capabilities over the full 26 miles by entering the Glasgow Marathon, and although his preparation didn’t go as intended, he nonetheless managed an impressive third. “Three weeks before I was due to run, I injured an ankle,” he recalls. “I ripped up my number thinking I wouldn’t be able to enter and resigned myself to being a spectator. Then the day before the race, I decided I wasn’t feeling too bad and that I’d give it a go. Really, in the circumstances – all my preparation having gone haywire and my fitness not up to scratch – finishing at all was a bonus but getting third in 2:19:43 was great! Hammy says luck has played a big part in his athletics progress. Had he not met Joe Haverson, he feels he would have continued approaching distance running the wrong way, and might have become discouraged and given up when his times didn’t improve. As it is, he found not only encouragement and guidance from Haverson but also from fellow runner Gerry Helme. The latter, who wears the hat of promotions manager for New Balance, was responsible for encouraging Cox to run in international races abroad. He also arranged a sponsorship which provided your man with a year’s supply of New Balance clothing and shoes. “I met Gery at the Derry Half-Marathon in 1988,” explains Hammy. “After the race he asked me what races I was planning for the rest of the year. When I told him my plan was to run the Dublin Marathon in six weeks, he was horrified and said I needed to run half-marathons and 10K races on a regular basis to build up to an event like that. He said he’d find me some races abroad and before I knew it he was ringing me up telling me I had a place in a ten miles road race in Holland the following week. Two weeks after that I was running in a ten mile road race in Germany.” The relationship forged with Helme has continued and even today Helme is largely responsible for the Greenock athlete’s participation in prestige road races abroad. “I thought that to appear in the sort of races Gerry was talking about, you’d have to be an Allister Hutton. If it hadn’t been for him I’d still be making do with two mile cross country races in Scotland – which aren’t really enough. On the whole I don’t think there’s enough encouragement or advice to Scottish athletes. After all, it was just luck that I met Gerry.” Cox says that the fear of disappointing his friend after he has gone to the trouble of securing him a place in a big race abroad is usually more than enough to make him turn out a good performance. He is also convinced that the higher number of quality races he now runs has played a major part in his development as an athlete. 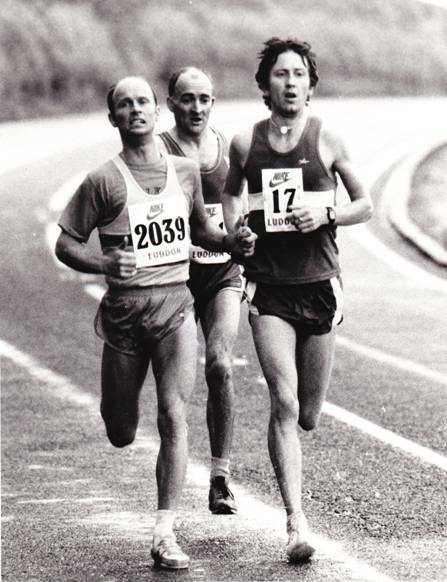 “When I went to the 1988 Dublin Marathon, I was more prepared than I had ever been and I ran my personal best time of 2:18:04,” he avers. “Actually I should be able to knock three or four minutes off that time, but most of the marathons I’ve run have been either very hilly or very hot. An unfulfilling road season behind him, Hammy decided that, for once, he’d put a lot of effort into the cross-country season. For once? “Usually I focus all my energy on road running and then lie low during the cross-country season,” he admits. I normally give cross-country about 60-70%, but this time I was determined to do well after missing so many of the major road races.” Last December he won the Renfrewshire CC Championships and in January came third and was awarded second in the West District Championships (Tommy Murray was disqualified with the rest of the field moving up a place). His winter season included wins in the Jimmy Flockhart Memorial Race, the Glenpark Harriers Willow Bowl and the CIBA Geiggy Road Race plus second places in the Nigel Barge and Bill Elder 10K. Despite his consistent road and cross-country form, Cox was overlooked for every cross-country international during 1990-91. It is a subject that he feels very strongly about – not least because he claims there has been a fair measure of confusion surrounding the reporting of what he has, and has not, said about the matter. “It’s true that I said I didn’t want to run for Scotland again at the West Districts, but it was just one of those heat-of-the-moment things, I was completely sickened at running so well and being passed over for the National side,” he says. “What had particularly aggravated me was that there had been a late call-off for the international at Mallusk two weeks earlier. The person who was asked to step in to the team hadn’t beaten me all season. The selectors tried to tell me they had picked someone who had no family and who would be available at short notice. But as everyone knew, I was intending running that day anyway – in the Nigel Barge. I was prepared to put that before family commitments so I’d obviously have put the Mallusk meeting before them. Although Cox admits he lost his cool at the West Districts (he distinguished himself by refusing to accept his medal) he says he later calmed down enough to make it known that he wanted to run in the UK Cross-Country Trials. He says this intent was picked up – mistakenly – as the inter-counties event by a well-meaning journalist who in turn informed the selectors. The net result was, according to Cox, that he looked like a ‘complete turkey’ who didn’t know his own mind. “I was duly asked to go to the inter-counties but I’d already arranged to spend the morning of that race taking my daughter to a race,” he says. “There was just no way I could go.” I explained to international team-manager Jim Scarbrough that it was the trials I was hoping for a race at. Unfortunately though nobody ever got to know about the mix-up and it looked as though I’d turned down the very thing I’d wanted.” Having performed well at the West Districts and with a good cross-country season behind him, Cox was convinced that his wish to go to the Trials could not be overlooked. He says he was supported in this belief by SCCU Secretary Ian Clifton, who indicated that the way to ensure getting to the trials was to run well at the West Districts after which the team was always picked. Despite this alleged assurance, Cox was – once again – overlooked. He remains bitter about the circumstances. “Normally the team gets printed in the paper very soon after the West Districts but this time it didn’t go in for weeks,” he says. “In the meantime I found out that a number of people had been phoned and asked to be part of the team. It’s my belief that they held off choosing the team as long as possible in the hope that they could pass me over. In the end it included a lot of people who weren’t running nearly as well as me . Out of the final nine they chose, I should have been about fifth. At the last minute I was made second reserve.” Having put his version on the record, Cox adds ruefully that he just wants to forget it ever happened. And despite everything he says he bears no personal grudges. A balanced unobsessive attitude. But then for all the controversy he has managed to immerse himself in, Hammy Cox seems to me that sort of man. Weekly training schedule: Monday – Thursday: Ten miles lunchtime, six miles home in the evening. Mon/Tuesday: 10 x 1000 with one minute recovery; 12 x 800 with one minute recovery. Friday: Ten Miles, or four if racing Saturday. Saturday: 12 miles plus 20 x 400 with half minute recovery if not competing. Sunday: 14 – 20 mile run. It is however as a road runner that Hammy is perhaps best known and we should have a look at some of his best races on his favourite surface. Note, please, that his E-G third stage run in 1983 was quite outstanding and the record set on that day was perhaps one of his best ever runs. After the race in Warsaw in 1988, he returned in June 1989 and led the field for the first half of the race but the heat got to him and he finished third in 2:22:0 behind Tony Duffy (2:18:38) and Ian Hagen (2:20:43). In the Luddon Half-Marathon in May 1987, Hammy won by half a minute. The picture at the top was taken after 7 miles – Graham Crawford (number 7) recalls Hammy telling him that if he had made one more surge, he would have dropped him at three miles, he was so shocked and stretched by the early speed – to which Graham replied that one more surge would have finished him as well! Hammy won in 64:31 to Graham’s 65:06 and Alex Gilmour’s 65:24. The time was a course record which withstood challenges from Peter Fleming, Nat Muir and Fraser Clyne before it was changed to a 10K in 1990. In September 1987 Hammy ran very well in the Glasgow Marathon where 5516 runners started the race. The race was won by Eire’s Eamonn Tierney in 2:19:19 with Scotland’s Terry Mitchell from Fife AC second in 2:19:40 and Hammy only three seconds behind in a personal best of 2:19:43. The race was very competitive with a group of 20 runners together at 10 miles. This was reduced to five at 20 miles. Tierney broke clear at 23 miles although MItchell closed the gap two or three times before losing touch with only a mile to go. Fast finishing Cox (Greenock Glenpark Harriers just failed to catch Mitchell. Hammy’s victory in the Edinburgh People’s Half-Marathon on May 1st in 66:14 from Alan Robson came before they both represented Scotland in the international team later that month over the full marathon distance at Aberdeen. Coincidentally his son Graeme (12) won the 200m and 400m titles at the Renfrewshire Championships on Saturday and daughter Jill (10) won the Inverclyde 200 ad 800m races on the Sunday. Cox celebrated after the race with fellow Scottish international Frank Harper from Pitreavie who came second. Edinburgh Southern Harrier Alan Robson Kept the English out of the medals by coming third. Cox said “England’s Dave Jenkin was the runner we feared most, but it was the Welshman Owen Lewis who gave us most to think about. We knew we had Jenkin beaten by the 12 mile mark.” The Scots had it all to themselves from the 14 mile mark, having motored to the halfway stage in 1 hour 9 minutes 20 seconds. And it was Cox who found the extra gear as Harper struggled around the 18 mile mark. The Greenock runner finally emerged with a 65 second winning margin on a day of triumph for the Scots. The battling Dave Jenkin salvaged some English pride in fourth place before Scottish team-mate Doug Cowie wrapped up the international team honours with fifth place. Hammy Cox (Scotland) 2:21:15; 2. Frank Harper (Scotland) 2:22:20; 3. Alan Robson (Scotland) 2:26:21; 4. Dave Jenkin (England) 2:25:55; 5. Doug Cowie (Scotland) 2:26:21. It was not made clear whether the British vest ever materialised but on 16th July that year he won the Nuremberg Marathon in 2:22:25 running for Glasgow in a Glasgow v Nuremberg match where Glasgow won the team race. He followed this on August 14th with fourth in the Glasgow Half Marathon in 67:49. One of Hammy’s best events was the Sun Life Great Race, referred to above, which involved a stage race from Glasgow to London – similar to the old Trans-Continental Foot Races, or the Tour de France for cyclists. The actual event Hammy referred to is reported in “Scotland’s Runner” for November 1990 by Jason Clark under the headline of ‘Paulo wins race, but Hammy, Brian and Graham are the local heroes.’. “The winner of the inaugural Sun Life Great Race was Paulo Catarino of Portugal who collected prize money of £35,000 for his not inconsiderable efforts. Twenty six year old Catarino completed the 230 mile, 20 stage race in the incredible time of 18-32-43. Consistency was the key to the event, illustrated by the fact that Catarino did not win a single stage over the three weeks of the race. The deciding factor in his triumph was that he did not finish any lower than eighth on any given day. Delmir dos Santos, the 24 year old Brazilian running for the American Boulder Road Runners Club took the green vest for the overall points winner. His colossal total of ten stage victories ensured his success. The first four stages of the race were dominated by 43 year old Kenyan, Kipsubei Kosgei if not always for the right reasons! Although he won all three Scottish legs, he self destructed when he was seen to strike dos Santos on the fourth stage from Gretna to Carlisle. The starting field numbered 107 when the race got under way in Glasgow on September 2nd. By the day of the final Westminster stage, only 82 runners remained. Many of the ‘big’ names withdrew or failed to finish including Mike McLeod, John Graham, Fraser Clyne (who was supposed to write a diary of the event for ‘Scotland’s Runner’), Steve Brace, Gary Kiernan and Dave Moorcroft. In the team contest, the lead changed hands many times before the Boulder outfit took the title. The above information was sent to me by Brian Kirkwood who might have more to add to a separate page on the Great Race but it is printed in tabular form so that the incredible performances turned in day after day by the leaders can be seen and the demands made on every one of the participants. 223 miles in 20 days! Unfortunately many of Hammy’s road races were abroad – Warsaw twice, Dead Sea in Jordan, etc – and not reported in the press back at home – it would be interesting to find what his own assessment of his best runs is. Competitively he is better than his placings in the all-time Scottish Road Rankings would indicate. They have him at sixteenth for 10K with a time of 29:29 run in 1991 and twenty first in the half-marathon with 64:57 run in August 1989. Meanwhile at the marathon distance, Hammy recalls 3 marathons in 1989. He did Barcelona (Scottish team) in the Spring (sixth). Warsaw in the Summer where he ran for Britain and came third and Dublin in October (second). He got another British vest in 1990 at the Hong Kong marathon, where he was 3rd. His last Marathon was representing Scotland in Las Vegas in 1991. This profile began with Hammy’s Dad, Bertie who was one of the long standing members of the Scottish Marathon Club and it is fair to close by mentioning his daughter Jill who ran for City of Glasgow. Jill was a popular and able athlete who ran right through all the age groups and who is still in action as a Vet 35. Ranked – often in the top ten and at times even higher – in the 1500m, 3000m, 5000m on the track and at 5000m, 5 Miles and 10000 metres on the road with an excellent record over the country as well, Jill continued the dynasty into the third generation. She had many victories to her credit including the Beith New Year’s Day race in January 2000 – the very first race of the new millennium has to be one for the scrapbook! Indeed a talented family with Hammy certainly the best – so far – and at least two of his times will never be bettered. The records set in the Luddon Marathon and the third stage of the Edinburgh to Glasgow both lasted until the races were finally brought to a close.